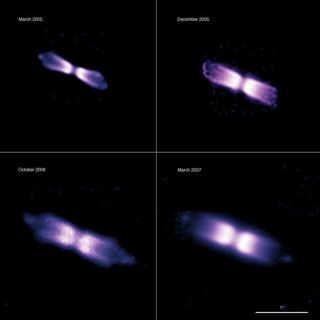 These time lapse images of V445 Puppis (taken with the NACO adaptive optics instrument on the ESO's Very Large Telescope in Chile) span two years. They show the expansion of the bipolar shell ejected by a "vampire star," which underwent an outburst after gulping down part of its companion's matter. A "vampire" star that underwent an outburst in 2000 aftergulping down part of a companion star looks to be a ticking time bomb: It ispoised to become the long-sought fuse to a certain type of supernova. The gas-sucking star is part of a double star system knownas V445 in the constellation of Puppis ("the Stern"). In November 2000, this system underwent a novaoutburst, becoming 250 times brighter than before and ejecting a largequantity of matter into space. To study the system further, a team of astronomers used theNACO adaptive optics instrument on the European Southern Observatory?s VeryLarge Telescope (VLT) in Chile to obtain very sharp images of V445 Puppis overa time span of two years. The images show a bipolar shell, initially with a verynarrow waist, with lobes on each side. Two knots are also seen at both theextreme ends of the shell, which appear to move at about 19 million mph (30million kph). The shell ? unlike any previously observed for a nova ? is itselfmoving at about 15 million mph (24 million kph). A thick disk of dust, whichmust have been produced during the last outburst, obscures the two centralstars. The VLT data also suggest that V445 Puppis could one dayexplode as a Type 1asupernova. Type 1a supernovas are a particular family of theselife-ending stellarexplosions, one prominent feature of which is a lack of a hydrogensignature in their spectrum, despite the fact that hydrogen is the most commonelement in the universe. V445 Puppis is the first, and so far only, nova showing noevidence at all for hydrogen. It provides the first evidence for an outburst onthe surface of a white dwarf dominated by helium. "This is critical, as we know that Type Ia supernovaelack hydrogen," said team member Danny Steeghs of the University of Warwick inthe United Kingdom, "and the companion star in V445 Pup fits this nicely byalso lacking hydrogen, instead dumping mainly helium gas onto the white dwarf." Type 1a supernovas are thought to arise in stellar systems composedof two stars, one of them being the end product of the life of sun-like stars ?white dwarfs. When such white dwarfs, acting as stellar vampires that suckmatter from their companion, become heavier than a given limit, they becomeunstable and explode. But the process isn't quite as simple as that: As the whitedwarf cannibalizes its prey, matter accumulates on its surface. If this layerbecomes too dense, it becomes unstable and erupts as a nova. These controlled,mini-explosions eject part of the accumulated matter back into space. The crucial question is thus to know whether the white dwarfcan manage to gain weight despite the outburst ? that is, if some of the mattertaken from the companion stays on the white dwarf, so that it will eventuallybecome heavy enough to explode as a supernova. Combining the NACO images with data obtained with severalother telescopes allowed the astronomers to determine the distance to thesystem ? about 25,000 light-years from the Sun ? and its intrinsic brightness ?over 10,000 times brighter than the Sun. This implies that the vampire white dwarf in this system hasa high mass that is near its fatal limit and is still simultaneously being fedby its companion at a high rate. "Whether V445 Puppis will eventually explode as a supernova,or if the current nova outburst has pre-empted that pathway by ejecting toomuch matter back into space is still unclear," said team member Patrick Woudtof the University of Cape Town in South Africa. "But we have here a pretty goodsuspect for a future Type Ia supernova!" The findings for V445 Puppis are detailed in the Nov. 20issue of the Astrophysical Journal.